An upcoming gathering of Internet experts could change the conversation around cyber security, network autonomy and network resilience in the Caribbean. On April 19, the American Registry for Internet Numbers (ARIN) will convene a special forum to address the needs of its Caribbean stakeholders. ARIN is one of five bodies, called Regional Internet Registries, that coordinate Internet number resources worldwide. "The ARIN Caribbean forum will feature keynote speakers, presentations, panel discussions and case studies on topics relevant to strengthening and safeguarding the Caribbean Internet," said Bevil Wooding, Caribbean Outreach Liaison at ARIN. Organisers expect dozens of regional and international delegates to attend, including government ministers, public sector technocrats, network operators, law enforcement agents, business executives, and members of the judiciary, legal fraternity, academia and civil society. The one-day forum will focus on three main streams: public policy, justice sector and technical capacity-building. The public policy stream will give a high-level view of current issues in the regional and international Internet governance space. The justice sector stream targets law enforcement and judicial officers, giving an overview of major issues related to defending against and responding to cyber threats. "Regional governments and security agencies are struggling to respond to illicit activities being coordinated in the Caribbean by large, well-funded, and highly organised international crime syndicates. Sessions at the ARIN Caribbean Forum will outline some practical approaches to regional collaboration to strengthen national and regional network security," Wooding said. The technical capacity-building stream will promote network autonomy, security and resilience. Network resilience refers to the ability to maintain acceptable levels of service in the face of a range of challenges, including technical misconfiguration, targeted attacks and large-scale natural disasters, including hurricanes. The forum follows the launch in February of an outreach initiative called ARIN in the Caribbean, which has so far held events in Grenada, Barbados, Saint Lucia, St Kitts and Nevis, and St Vincent and the Grenadines, with another planned for Dominica in the coming months. "Strengthening regional communications networks is a priority for the entire Caribbean. As our citizens, businesses and institutions place greater reliance on Internet-based technologies, closer attention has to be paid to safeguarding Internet infrastructure from threats in the physical and virtual world," Wooding said. ARIN's Caribbean Forum will immediately follow its public policy meeting, which takes place at the same venue in downtown Miami from April 15 to 18. 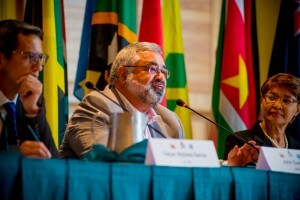 The Caribbean Network Operators Group (CaribNOG) will hold its 15th regional meeting at the same location from April 18 to 20, with the support of ARIN, the Caribbean Telecommunications Union, the Internet Society, the Internet Corporation for Assigned Names and Numbers, the Latin American and Caribbean Internet Registry and Packet Clearing House. Caption: From left, Oscar Robles, CEO of the Latin American and Caribbean Internet Registry; John Curran, President and CEO of the American Registry for Internet Numbers; and Bernadette Lewis, Secretary General of the Caribbean Telecommunications Union (CTU) at the CTU ICT Week and 16th Caribbean Ministerial Strategic ICT Seminar held in Nassau, Bahamas from November 27th to December 1st, 2017.